Purchased on the L.W. Frohlich Charitable Trust Fund, 2002. Bookplate of John Waterhouse Halifax; bookplate of Oliver Aveyard Beckerlegge; lot 1 in an unidentified English auction; purchased by the Morgan Library in New York, Swann Auction Galleries, April 18, 2002, lot 12. Ms. devotional texts; written and illuminated in France, ca. 1540-1550. Texts: Saint Augustine, Homiliae in epistolam sancti Johannis (fol. 1-47v), note: this text is incomplete and ends in the middle of the sixth letter; Origen, Homilia de beata Maria Magdalena (fol. 48-56v); Vita beate Marcelli parisiensis episcopi et confessoris (fol. 57-60). Scribe: Many of the words are provided with red accent marks to facilitate smooth reading aloud and correct pronunciation. Decoration: Two historiated initials (Temptation of Adam & Eve on fol. 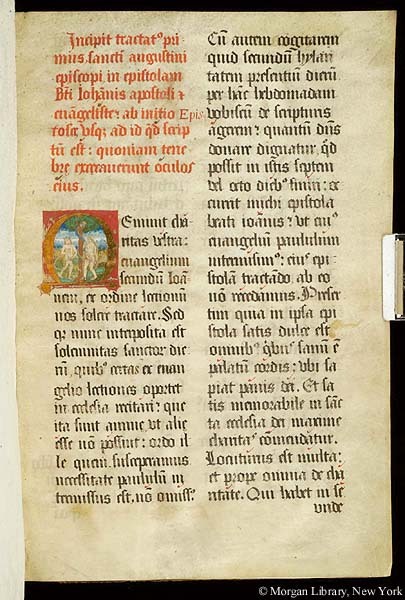 1 and Levitation of Mary Magdalene on fol. 48) and one foliate initial (on fol. 57).